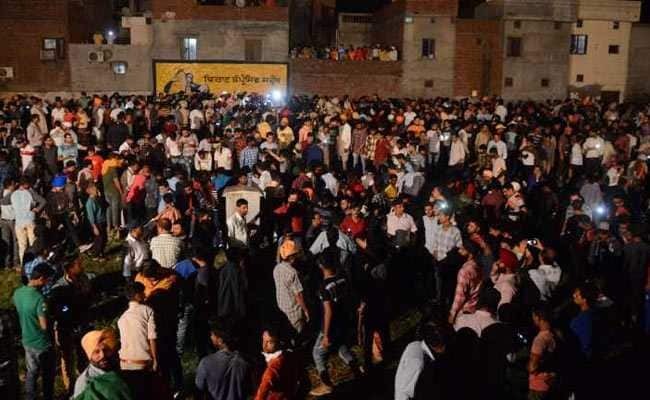 Big Train Accident Happened In Amritsar, More Than 50 People Killed At Time Of Ravan Dahan: A huge train accident has occurred in Amritsar, Punjab, in which 50 people have been confirmed dead so far. At the spot, the senior officials of the railway have reached the police force. Rescue and relief work is going on. The injured are being transported to the hospital immediately through 108 ambulances. Let me tell you that this train was coming from Pathankot to Amritsar. According to the people present at the scene, Congress leader Navjot Singh Kaur Sidhu came to participate in Ravan Dahan program. It is being said that people got scuffle with the Cabinet Minister OP Soni, who arrived at the spot when the incident was reported. Let us tell you that the Dussehra festival was being celebrated near the joint gate of Amritsar, when the Ravan models were set on fire, at the same time people got into the railway track between the stampede. Meanwhile, the train arrived, due to which hundreds of people got hit by the train. At the same time, the railway superintendent of the NDRF has reached the spot with the team and started rescue operations. Although the official has not yet confirmed the number of people who died from the railways. According to the people present there, it was a big accident due to the trains coming on the tracks of the railway. According to the people present at the spot, the speed of the train was very high, while looking at the crowded area, its speed should be very low. Let me tell you that the local people are very resentment about this incident. At the moment people are reaching the spot and are looking for their loved ones.